I may not be qualified to tell you much about what the most successful people do before breakfast, but I can tell you for certain what they don’t do. They don’t repeatedly press the snooze button. They don’t cuddle under the covers checking email and social media until they absolutely must get out of bed. They don’t run around their houses like a crazy people, trying to locate all of the stuff they need for the day so they can rush out the door, already running late. In other words, the most successful people don’t do many of the things I typically do in the morning before I eat my protein bar in the car on my way to work. 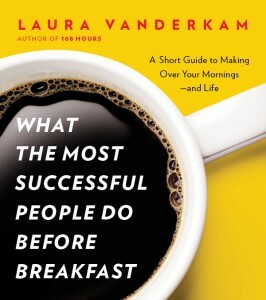 It’s pretty obvious why I read Laura Vanderkam‘s book, What the Most Successful People Do Before Breakfast. My mornings needed a mega makeover. I bet some of yours do as well. I enjoyed Vanderkam’s book 168 Hours: You Have More Time Than You Think and hoped my second, sadly much shorter, read from her would provide just as much helpful insight. It didn’t disappoint. “Successful people have priorities they want to tackle, or things they like to do with their lives, and early mornings are the time when they have the most control of their schedule” (p. 25). 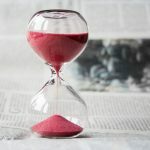 “If you wait until the end of the day to do meaningful but not urgent things like exercise, pray, read, ponder how to advance your career or grow your organization, or truly give your family your best, it probably won’t happen. If it has to happen, then it has to happen first” (p. 28). “New research into that old-fashioned concept of willpower is showing that tasks that require self-discipline are simply easier to do while the day is young” (p. 34). “Successful people turn high-value tasks into morning rituals, conserving their energy for later battles” (p. 42). 1. Nurturing their careers – strategizing and focused work while their minds are the freshest and clearest. 2. Nurturing their relationships – giving their families and friends the best. I was interested to read that “dual-income couples could find only 12 minutes a day to talk to each other.” No wonder it’s difficult to stay connected with our spouses. 3. Nurturing themselves – exercise and spiritual and creative practices. Apparently people who exercise in the morning are more likely to stick with it. This makes sense because you can’t say you’re “too busy” first thing in the morning. These things sound much better than running around like a chicken with my head cut off because I didn’t prepare properly the night before. But I know from experience that saying you’re going to exercise in the morning is a heck of a lot easier than actually getting out of bed to do it. Learning to get the most out of your morning involves a five-step process, Vanderkam wrote. 1. Track your time. Part of spending your time better is knowing how you use it. 2. Picture the perfect morning. Once you know how you’re spending your time, you should think about how you wish you were spending it. 3. Think through the logistics. Is your ideal morning possible? What will you have to do to make it happen? The best way to bridge the gap between what you’re doing and your perfect morning is to create a realistic timeline, determining how long activities will take and when you’ll have to wake up to make the ideal a reality, Vanderkam wrote. 4. Build the habit. This will take some willpower in the beginning, but habits can be formed. Vanderkam suggests waking up earlier 15 minutes a day until your new schedule seems feasible. She also suggests adding one new habit at a time, so you don’t overwhelm yourself. 5. Tune up as necessary. As your life and needs change, so will what your perfect morning entails. The most successful people know that these hours are too important not to spend in intentional ways and that needs change and should be re-evaluated, Vanderkam wrote. 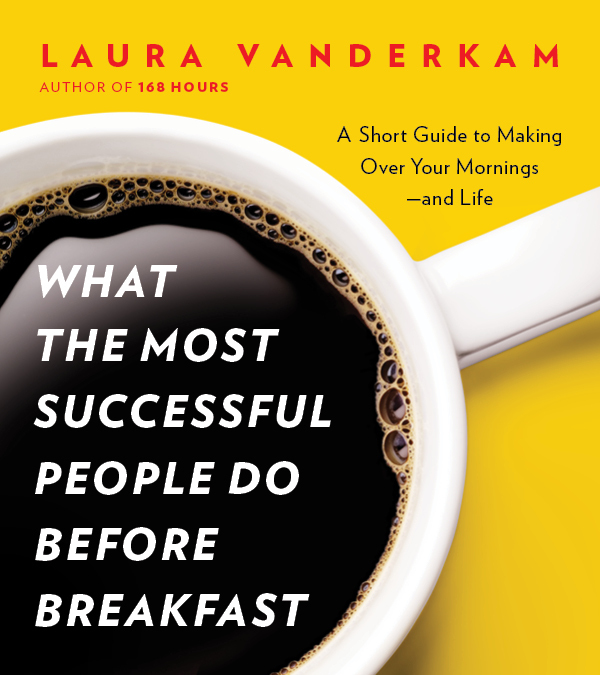 Vanderkam’s book does an excellent job of detailing what many people do in the morning, what we should be doing and how best to turn those behaviors into new, helpful habits. While I haven’t incorporated all of the ideas yet, I am making little changes and seeing a marked difference. 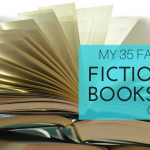 You also should read Vanderkam’s short ebook and makeover your mornings for the better. @westfallonline have you read this book, Chris? @westfallonline it’s short and interesting. I was doing basically none of the items encouraged. @KDillabough I liked that one too. Cute storyline. @danielnewmanUV @profkrg I enjoyed this book as well! It literally changed my mornings for the better! Great summary!! Thanks Kenna. This review of yours makes me feel 100% inadequate. I’m now going to take a nap. barrettrossie perhaps then you can get up earlier and be even more fabulous? Wow…I feel convicted by this! I am having a love affair with that snooze button. And yes, I also use two different alarm clocks — my “real” clock and my iPhone. I always considered that a function of not being much of a morning person, but this post gives me a different perspective on that. patricksplace I am a terrible example of what you should do in the morning. I thought I was getting better, but I think I may just fail at mornings. I just love my bed so much! Thanks, Patrick, for reading and commenting. This is really interesting, I am actually doing most of these tips now and didn’t have a clue. Might explain why my career really started picking up this year in only three short months. I have a couple morning rituals that help me focus on my goals. I always save the grunt work for the late evenings because it is the stuff that has to be done, but doesn’t move me forward. Totally going to pick up a copy of the book and see what else I can do. susansilver You actually will need to read it on a device. It’s eBook only. It’s interesting that you’re already doing so many of these things. Would you like to share your morning routines that are helpful to you?